medium long, sweet, later bitter, some iodine? B: Mild smoky, fine spiciness, salt, spray from the sea. A fresh fruit note, maybe freshly cut pears. T: Much more restrained than Bud. Very light smoke and some salt, but the fruit dominates. No pears as in Bud, more towards mild citrus (tangerines). B: Pleasantly strong and creamy. Directly a dry wood note on the tongue, lots of salt, pear pieces. Cool smoke of a campfire, mixes beautifully with fruit and salt. Fine-sour chocolate comes, freshly roasted coffee beans and not too sweet honey. Always accompanied by a pleasant salty note. Rosy paprika and Cheyenne pepper push the fruity-fresh notes into the background after a while. T: Even Terence lathers vigorously on the tongue, brings a good dose of salt, but less dry wood with it. Like in the nose, there are tangerine aromas, along with vanilla and cocoa. Character: Interesting, intense and balanced. A very nice standard with spicy power. You should like malt, oak, smoke and warming chili. In any case, a Malt that makes you want more and invites you to various follow-up rounds. Evaluation: Unrestrictedly good and one of the comparatively rare cases in which the nose drops slightly compared to taste and finish. The nose is also very nice, but it seemed to me at first glance a bit "grumpy" and somehow a bit difficult to access. The taste is intense, exciting and at the same time balanced in a unique way. The spice gives this drop recognition value and the interplay of smoke and oak gives rise to pure joy. For me, the best filling in the entire experiment. A whopping 88 points . Tasted in the blind attempt "old against new" on www.fassstark.de, "Experiment - in the past everything was better", comparison against WID 35001. Basic flavors: malt, cereals, peat, smoke, fruit, citrus flavors, wood, spices, furniture polish, maritime *, leather *, vanilla *; Comment: * = barely Description: Immediately, grain, smoke and intense citrus aromas make their way. Add to that a beautiful, spicy oak and comparatively light fruit flavors. I am reminded of bright grapes and pears. Ostensibly, however, a load of furniture polish is spreading and somehow I feel a slight, not unpleasant impact towards the adhesive. In the meantime, subliminally a rather restrained maritime freshness blows through the glass: a very slight pinch of algae-swollen sea spray. A touch of leather and vanilla completes the aroma spectrum. Compared to the new bottling, I find the nose "tart and edgy" and not quite as complex. It is really good, but in direct comparison I find the new bottling even more exciting and delicious. The old bottling is less maritime and less sweet. Dried fruit I do not actually perceive and the fruit flavors are comparatively "bright". Basic flavors: malt, grain, seasoning, wood, fruit, citrus aromas, vanilla *, coffee *, smoke *; Note: * = barely Description: Clear and intense, the drop hits the tip of the tongue. As soon as grain and malt have reached their flavor, a really intense spice spreads throughout the mouth. It's not really peppery - is this the famous chili-catch of Talisker? The resulting heat answers the question. Over time, the spice sets and in addition to malt and cereals, the oak comes peu a peu to advantage. It is not quite as set up as in the new bottling. I really like that here. In addition to hard-to-specify fruit flavors and luminescent lemons, there is plenty of room for beautiful hints of vanilla and coffee. 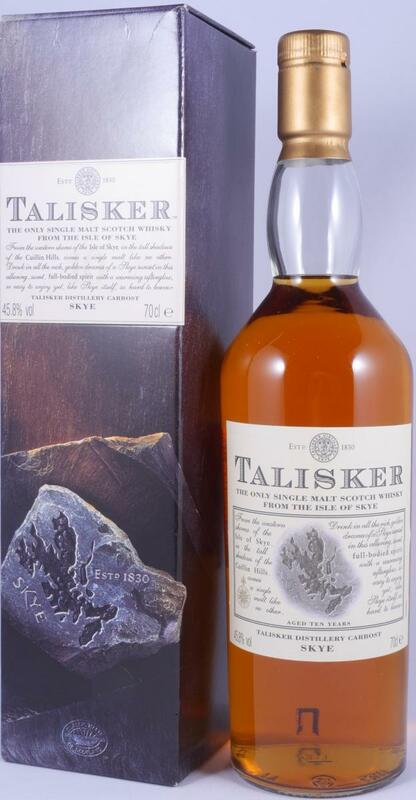 Smoke is also present, but by no means as dominant as the new Talisker 10. The taste image I like better in direct comparison to the new bottling. I just think it's more elegant and not quite so set up. 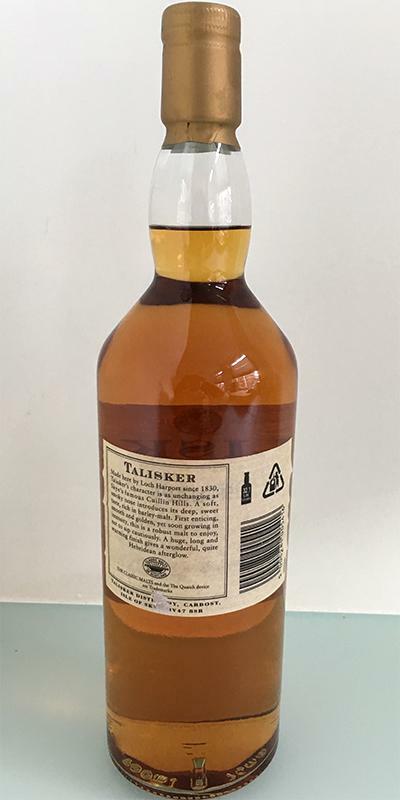 The new Talisker 10 is killed by comparison of smoke and oak. Everything seems more harmonious and the intensity leaves nothing to be desired. There is no trace of the idea "just before watery". Basic flavors: malt, smoke, wood, citrus, spice Description: The finish is medium to long. A really nice combination of malt, smoke, oak and lingering citrus fruits (like lemon oil) lingers in the mouth for a long time. 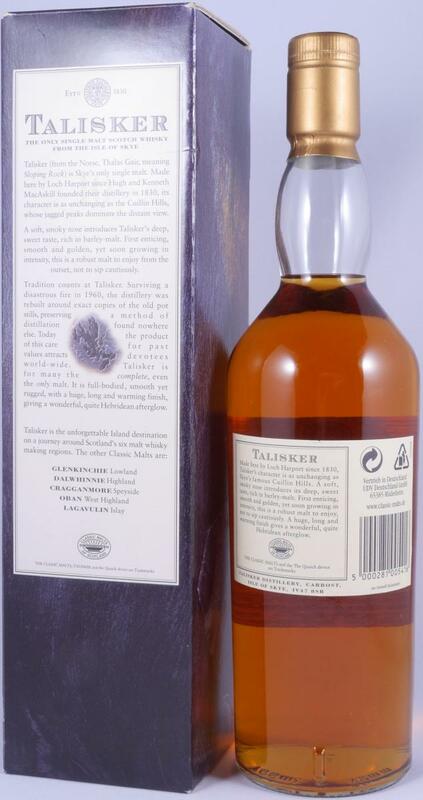 Compared to the new Talisker 10, the finish is also less worn. It is not as bad oak and significantly less smoky. Somehow spicy. Another kind of "intensity". Smoky, malty sweet, with sourness and very big pepper developing. Very peppery, huge and long. The Stone Label ranks right between the Map Label (15128) and the New Label (68682). He looks a bit fresher than the Map Label, but not as fresh and peppery as the New Label. In the taste again very soft. For me, the creamiest of them all. Minimal smoke. In the finish, I have here again a slightly sour note, but in the smallest way is as pronounced as that of the Map Label. The finish is relatively long. Oh yes, it stays really long. Here, too, the second sip turns the acid note on the finish too strong. Very complex for a 10 year old, it confirms my score from a few years ago. I wish I had bought this by the case when I started to drink whisky at the end of the nineties. Old nose, with a combination of sweet, honeyed barley and waxed paper. Furthermore, soft peat, orange, mint and eucalyptus, a hint of licorice root, vanilla and soft oak. Nicely balanced, soft attack, with quite some smoke, a bit more influence of the sea (salt, dried fish), with still plenty of orange, grass, licorice, wood and pepper. Great finish with quite a kick of black pepper, but with dried fruit alongside the orange now, soft traces of peat smoke, and a hint of vanilla. Beautiful dram, full of flavor, nice balance of smokiness, fruitiness and sweetness. Both in the smell, taste and finish. 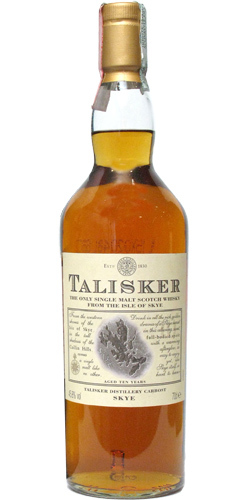 It is a pity that the newer whiskys from Talisker do not seem to make it anymore.